Hi! Sorry I’ve been a bit quiet lately. I’ve had a major computer failure and am currently struggling along with an old and slow laptop. As a result I’ve had to cancel all my forthcoming broadcasts on Blog Talk Radio. There is one piece of good news however. I’m currently working on another project, which is near to completion. 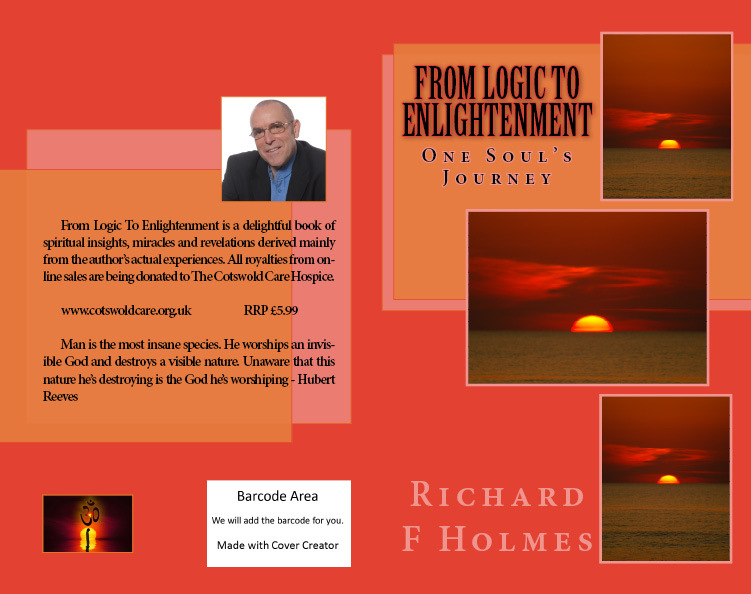 It’s a booklet called From Logic To Enlightenment. A delightful book of spiritual insights, miracles and revelations derived mainly from the author’s actual experiences. !00% royalties from online sales are to be donated to Cotswold Care Hospice, which is where I work for three days of the week. I hope to be up and running as normal again soon. Thanks for hanging in there, and in the meantime take a look at my new cover below and leave your comments. I’d love to know what you think of it. See you soon! This entry was posted in General and tagged Blog Talk Radio, Cotswold Care Hospice, From Logic To Enlightenment by Bloggin With Rich. Bookmark the permalink.